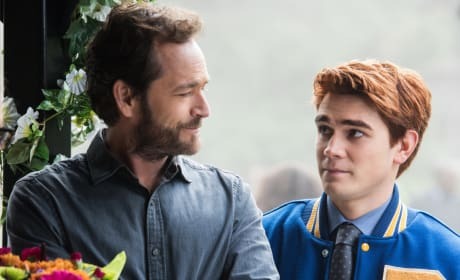 Riverdale Photos from "Chapter Twelve: Anatomy of a Murder"
On Riverdale Season 1 Episode 12, Archie and friends decide it's time to share the truth about FP Jones with their parents. Will they take it well? We have the photos. Riverdale Photos from "Chapter Eleven: To Riverdale and Back Again"
On Riverdale Season 1 Episode 11, Betty is busy planning Homecoming weekend, and Alice asks for help in the Jason Blossom investigation. We've got the photos! 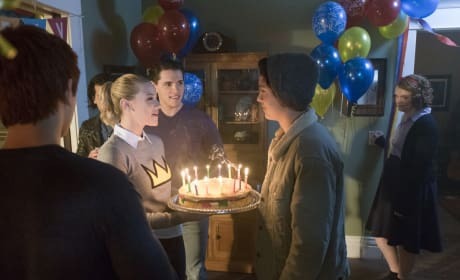 Riverdale Photos from "Chapter Ten: The Lost Weekend"
On Riverdale Season 1 Episode 10, Betty and friends decide to throw Jughead a surprise birthday party. Will it be a night to remember? We have the photos. Riverdale Photos from "Chapter Nine: La Grande Illusion"
On Riverdale Season 1 Episode 9, Veronica breaks down over her guilt and Archie goes on a date with Cheryl. Ethel (played by Stranger Things's Shannon Purser) returns. Riverdale Photos from "Chapter Eight: The Outsiders"
On Riverdale Season 1 Episode 8, Betty and Veronica throw Polly a surprise baby shower to cheer her up. Is the party a hit? We have the photos. Riverdale Photos from "Chapter Seven: In a Lonely Place"
On Riverdale Season 1 Episode 7, Betty organizes a search party to locate her missing sister. Will they find her safe and sound? Check out the photos! Riverdale Photos from "Chapter Six: Faster, Pussycats! Kill! Kill!" 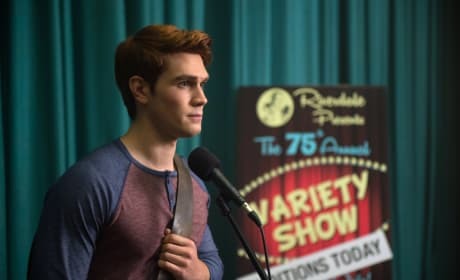 On Riverdale Season 1 Episode 6, the chance to perform at the annual Riverdale Variety Show causes tension for Archie and friends. Check out the photos! 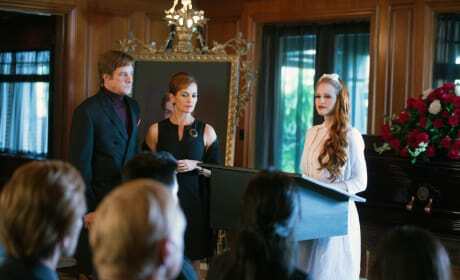 Riverdale Photos from "Chapter Five: Heart of Darkness"
The Blossom family has invited his classmates to attend their son's funeral, and Archie gets the opportunity to develop his music on Riverdale Season 1 Episode 5. 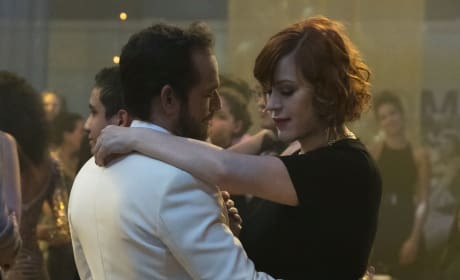 Riverdale Photos from "Chapter Four: The Last Picture Show"
On Riverdale Season 1 Episode 4, Mr. Andrews is falling for a certain music teacher in town. The only problem is that his son is dating her. We've got the preview photos! 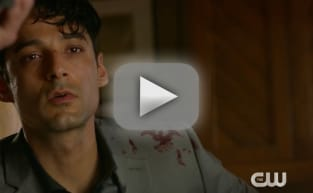 Riverdale Photos from "Chapter Two: A Touch of Evil"
On Riverdale Season 1 Episode 2, the discovery of Jason's body is keeping everyone on edge. But will their lives stay normal? We have the photos! 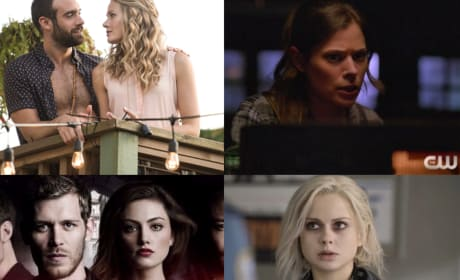 The CW Cheat Sheet: Final Predictions For The Originals, iZombie & MORE!!! Will the fate of Frequency and No Tomorrow rest on The CW's midseason series? We have the full analysis about what we think with happen to your favorite shows! Frequency and No Tomorrow: First Looks at New CW Shows! The CW is offering up some in depth first looks a the two new shows on its fall schedule. One is familiar, but both seem to be well-suited to the network. Watch now!